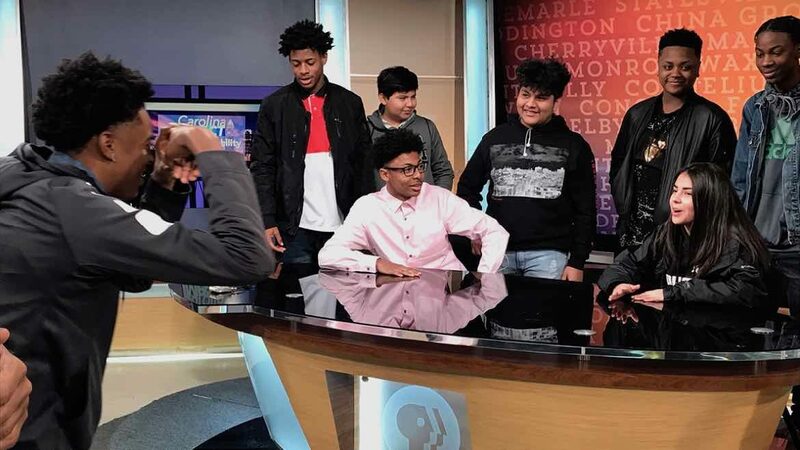 Charlotte-area high-school students practice hosting and shooting video during a visit to PBS Charlotte's studios. CPB’s ambitious American Graduate program, which has invested $28 million dollars over seven years advocating to keep kids in school, has shifted to a new phase: educating young people about in-demand careers. Plugging workers into “middle-skills” jobs, which require training but not a college degree, is becoming a priority in many states and communities. Those careers — such as electricians, dental hygienists, paralegals, construction workers and police officers — make up the largest part of the labor market in all 50 states, according to the National Skills Coalition. “The need for skilled people in our workforce is only growing, and as students begin to think about their future post–high-school diploma, this is an important consideration,” said Amy Shaw, SVP of engagement and content at Nine Network. The St. Louis pubcaster continues as lead station for the initiative’s latest phase, American Graduate: Getting to Work. So the latest grants allow public broadcasters to produce content to help kids discover those opportunities. Stations are working with partners such as local and state education and workforce agencies and community nonprofits. Nineteen stations received $3.7 million in grants announced in January ranging from $170,000 to $200,000. Some grantees have years of experience in education and job-skill engagement, such as KUEN in Salt Lake City. Since the station took over a state-funded career website in 2015, registrations have increased almost threefold. Other pubcasters, such as Idaho Public Television, are first-time American Grad participants. The station is hiring a full-time multimedia producer for the project. And PBS Charlotte is using its grant to reach more deeply into some of its community’s poorest high schools. The North Carolina station’s work includes a series of inspirational videos starring ambitious youngsters that played on the Jumbotron at a sold-out Hornets NBA game. “In 28 years of television including multiple regional Emmys, I’ve never been more excited about anything in my career,” PBS Charlotte GM Amy Burkett said of the station’s project. PBS Charlotte’s “3D Project: Dreamers, Doers, Destiny” is its first engagement plan that will stretch over four years. The initiative, tied to the state’s focus on upward economic mobility, kicked off last fall and runs through spring 2021. As many other stations have done, PBS Charlotte is using CPB’s $200,000, two-year grant to grow additional funds. According to CPB, local American Grad grants have helped generate an additional $17 million at stations from 2011­–16. 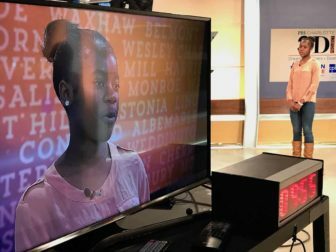 High-school student Karen Shonganie delivers her “I Have a Dream” speech at PBS Charlotte’s studios. The station is using its grant to fuel a three-part project. For “Dreamers,” it’s creating 32 five-minute video features and promos spotlighting people who have successfully moved out of poverty. One is a former drug dealer who now runs a barbershop and developed the nationally recognized “Cops and Barbers” community discussion series. Next comes “Doers,” which will report on students from Charlotte-Mecklenburg Schools who have earned scholarships to Central Piedmont Community College. And for the “Destiny” phase, spanning the entire four years, station staffers will teach 600 students at five high schools TV production skills to research, write and produce “I Have a Dream” speeches. The videos are posted on the station’s website. Several will also be broadcast as interstitials. But it was a special presentation on the Jumbotron at a sold-out Charlotte Hornets game in January that really got the kids excited, Burkett said. The team invited the students to attend over Martin Luther King Day weekend to see videos play in front of 20,000 fans. “Everybody cheered” for the videos, Burkett said, who added that the moment was as overwhelming for her as for the kids. KUEN in Utah is helping kids find their careers by building on the success of UtahFutures.org, which the state created in 2009, said COO Laura Hunter. The portal helps users identify professional interests and pinpoint education and job opportunities. Utah Gov. Gary Herbert declared 2018 as the year of technology education. “It’s a big state focus,” which fits nicely with the latest American Graduate push, Hunter said. With its $200,000 KUEN is creating 20 short “myth-busting videos” that challenge misconceptions about middle-skill careers, Hunter said. Other videos will highlight success stories to inspire kids to look into those jobs. The content will appear on KUEN and its public media partners statewide, their websites and social media accounts. The grant will also fund events including roundtable discussions about a career toolkit for parents. Like many American Grad projects, a consortium of partners across multiple fields provide input for the portal. State organizations include the Board of Education, the State Library, the Department of Heritage and Arts, the Utah College of Applied Technology and the Department of Workforce Services. 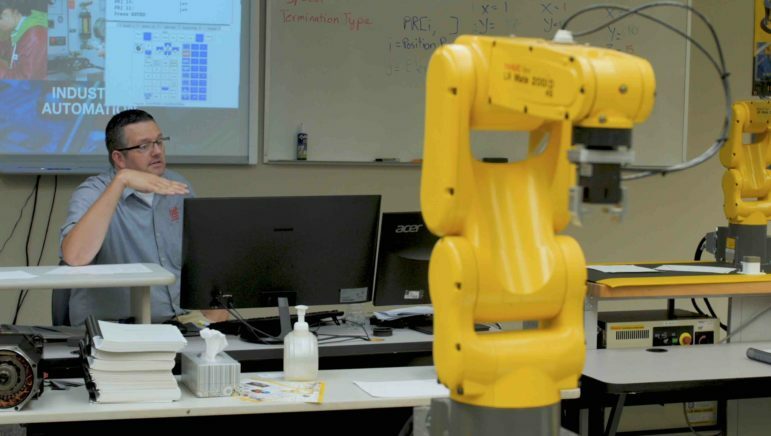 Utah American Graduate Champion Matt Fuller, an instructor at Bridgerland Technical College in Logan, uses KUEN’s distance-learning system to teach robotics. KUEN, an educational independent TV station, “is viewed as the convener and a natural partner,” Hunter said. “A lot of people on the UtahFutures steering committee said it makes so much sense to have us lead this work.” KUEN received its first American Graduate grant in 2014. Data show about 14,000 unfilled openings in Utah for software developers alone, Hunter said. Companies also need help, including aerospace workers, lab technicians and diesel mechanics. “Through this project, KUEN will help more Utahns make well-informed decisions about education and career planning,” said David Woolstenhulme, commissioner of the Utah System of Technical Colleges, in the grant announcement. Career planning is also a hot topic in Idaho. Gov. Butch Otter’s office created a Workforce Development Council last year to coordinate education and labor agency efforts aimed at placing workers into job sectors such as aerospace, food processing, natural resources and construction. Idaho PTV GM Ron Pisaneschi and Jeff Tucker, station director of content services, will attend a council meeting this month. The statewide network previously aired American Graduate Day programming and produced American Graduate Champion videos celebrating local mentors but never requested a grant. Idaho “has a strong high-school graduation rate,” Pisaneschi said. But the new phase of American Graduate “seemed like a perfect fit” with the state’s workforce focus, he said. With its grant of $198,000, Idaho PTV has hired a multimedia producer to collaborate with partners on job videos targeting parents, students, career counselors and business and industry representatives. “The same story may be cut very differently to appeal to, say, a 16-year-old and the HR person at Chobani,” Pisaneschi said. Yogurt manufacturer Chobani is one company actively seeking trained employees in the state. Chobani’s CEO recently announced a $20 million expansion of its facility in Twin Falls, Idaho, already the world’s largest yogurt plant. A community college is teaching workers how to program and operate specialized equipment at the plant, Tucker said. “We’ll be helping young people understand how those skills also open up possibilities for other careers as well,” he said.